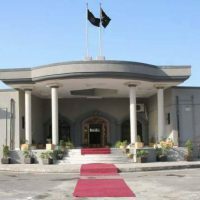 ISLAMABAD: The Islamabad High Court (IHC) issued contempt notices to the owner and four employees of Waqt TV on Wednesday after taking exception to a programme aired this week. Justice Shaukat Aziz Siddiqui issued the notices to Rameeza Majeed Nizami, the owner of Nawa-i-Waqt Group, anchorperson Matiullah Jan, bureau chief Sardar Hameed and producers Mohammad Ali Javed and Zeeshan Mehmood over the contents of Apna Apna Gareban, a programme hosted by Mr Matiullah on Monday (Feb 5) which examined allegations that lawyers had encroached upon a football ground in Islamabad’s Sector F-8. The IHC order said some of the utterances made in the programme amounted to contempt of court. The court will resume proceedings on Feb 12.